As cities continue to evolve into densely populated areas, they will become dense/intelligent organisms. For this reason, cities of the future must accept gradual transformations in the unpredictable shifts of spatial and social structures. The future of cities is intrinsic to organic growth. 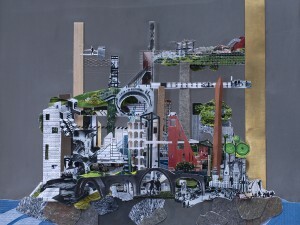 Among others, Yona Friedman and the situationists pleaded for a compact city, believing that building above existing structures could diminish outward expansion, and could create an open structure for adaptable configurations that enable the growth of cities while also restraining the use of land. However, we should not pursue imposing, largely scaled buildings in order to house the ever-growing expansion within cities. Instead, we must embrace an organic development and render the unexpected admissible. The real context of this urban slice, Washington Heights, exemplifies a tranche of the city with a complex urban fabric that includes (mostly) mid-rise social housing, commerce, churches, schools, a cemetery, the “oldest” house in Manhattan, Riverside Park, highways, middle class homes, and very little public space (only the streets and the cemetery, actually). 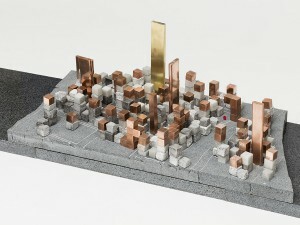 This model is sort of a “plastic poem” that speculates about the possible structure of a projective urban scenario. Gaps and agglomerations, towers and voids…architecture here presents itself as an abstract registration of human thought and a powerful evaluation of the definition of structure. We believe in crowdsourcing and organization as an ecology of ideas (set in practice) swarming over the solid urban topography of a multilayered history. Multilayered capacity of growth deals with anti-segregation of ideas and knowledge, with collaboration between trans-generational individuals pursuing an active public life. It is the inhabitation and inhibition of transit spaces; densification rather than expansion. Each iron filing represents an individual or a housing unit. The new topography takes shape because of the cohesion among all the entities. The iron filings represent the crowds and their space, while the magnet represents collective space (intellectual and physical). The fluctuation of the materiality is conditioned by the strength of the magnet; the collective strength. Magnetic Fields speculates metaphorically about the future; of how we cannot control or predict what cities will turn into, nor measure exactly how they will evolve. The magnet represents the cohesion of public space and the need for an open-source collective infrastructure to consolidate ideas into space. After all, ideas are fundamentally social, and cities are spaces where ideas are incubated, moved, and progressed. The model reinforces the idea that individual space (the minuscule iron filings) is spread over a cohesively consolidated tectonic space (the stone, a totem of gathered intelligence and development and agglomerated individuality). The model takes shape aiming to render visible the fragile connection between the two. Cities will not survive unless we find ways to strengthen this connection by looping back the gathered intelligence and projecting it onto our immediate present. We present this model to stress individuality as an effect of crowd behavior, by interconnecting yielding points of great density and focus. The multicultural and multidisciplinary office of Tatiana Bilbao analyzes urban and social crises, as well as the rigid codes of communication and telematics. Through these strands, her office regenerates spaces to “humanize” them by making them aware and reactive to global capitalism, opening up niches for cultural and economic development. Projects in Mexico include the Botanical Garden Culiacan; Funeral House, San Luis Potosi; Universe House (designed with Gabriel Orozco), Puerto Escondido; Parque Biotecnologico, Culiacan; Centro de Artes Escenicas, Guadalajara; and Ventura House in Monterrey. The firm also designed the Jinhua Architecture Park in Jinhua, China. Architecture, graphics, mechanics, coding, literature, and paintings influence Díaz’s work. The semiotics of materials and objects is an important part of his artistic search. He understands collaboration as an essential part of daily work for ideas to grow, cool off, and lose control. Since 2015, Díaz has run Taller Tornel, producing art and architecture installations. His work has been exhibited in many institutions, galleries, and private venues and projects.